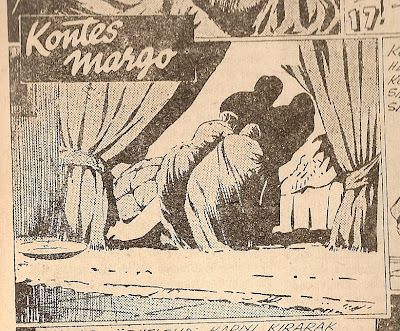 Several pre-war comics of Yugoslavian origin were among the many comics published in Turkey's major war-time weekly comics magazine 1001 Roman during the last two years of its first series (1939-46). Especially the works of artist Konstantin Kuznjecov appear to have been featured regularly between 1945-46. The first comics by Kuznjecov that I have been able to identify as being reprinted in 1001 Roman is the outstanding 'Grofica Margo (Countess Margo)' which was serialized in no. 's 283-327 in 1945 as 'Kontes Margo'. 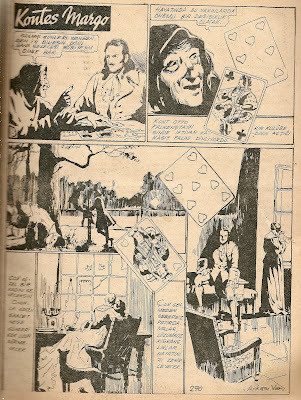 It had originally been published in Yugoslavia's Mika Miš comics magazine in 1938. The gruesomely cruel actions do not end here as the husband, who happens to fall onto the scene just too late, has poor Margo walled up in a chamber alive... Her grandmother curses the whole family as a result. After the long flashback ends, the plot resumes with further appearances of a ghost in the castle terrorizing the new owners as well as some less supernatural-looking attempts on their lives. With secret passages and black hooded figures, it reminds me the best of Edgar Wallace mysteries, esp. The Black Abbot (1926). The Turkish edition in 1001 Roman is a flawed reprint unfortunately. Some sequences during the flashback appear to be abridged with a few pages completely redrawn ineptly for some reason. Furthermore, roughly halfway through the story, the format changes from full page (as in the first scan at the top of this blog) to 2/3rds of a page with standartly neat row/panel design (as in the above scan) at the expense of the free-style layout of the earlier pages. 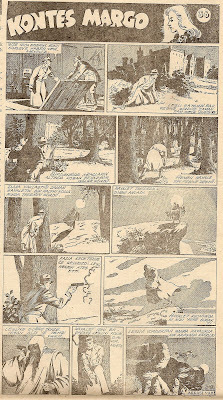 Prior to its run at 1001 Roman, 'Grofica Margo' had also been reprinted in the French comics magazine Gavroche (no. 13-54) in 1941 in a colorized edition which foregoes the subtleties of the original black&white art. I found your blurb about the book on a random site when I was trying desperately to find out where the cover art of the jackall/dog head is originally from. Do you know where the art originates? I'm thinking of using it as a tattoo design, but I'd love to know what book or comic it is from.